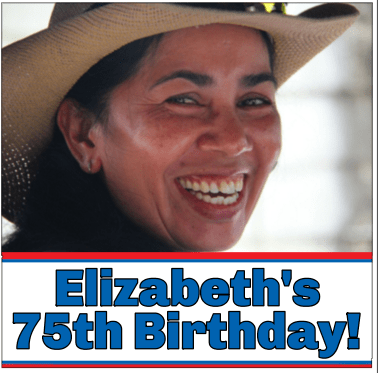 My favorite way to decorate for a milestone birthday party, such as a 75th, is to use loads of photos of the birthday celebrant. It’s so much fun for everyone to see how much he or she has changed over the years. Pictures are great ways to bring back memories, and are fabulous conversation starters. 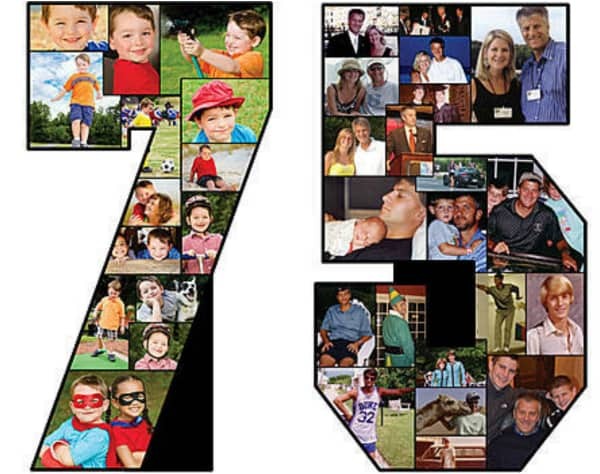 No need to fuss with trying to tape pictures to the wall in the number “75” – you can easily create a beautiful, professional made photo collage of numbers at Shindigz! 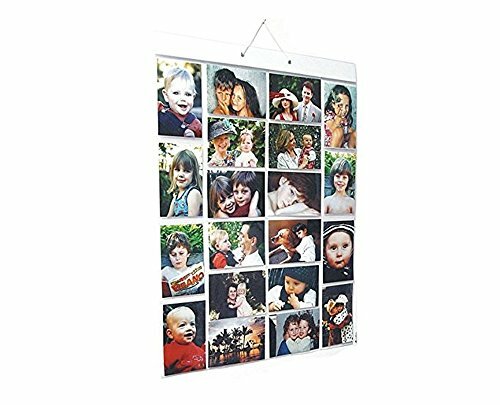 Just upload your favorite pictures, and they’ll print them on sturdy cardboard, ready for hanging or to use free standing. Prices start at under $12 – and the birthday guest of honor can then enjoy them at home after the party is over! You can also order letters if you’d prefer to use their initials. 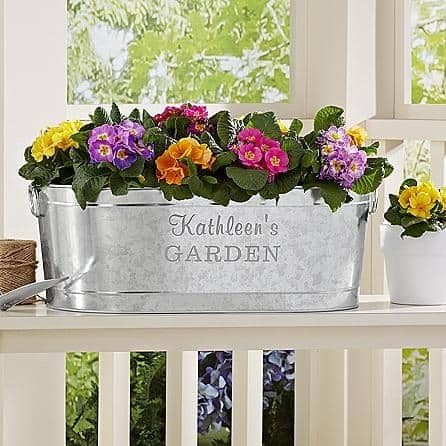 Leave it up to our good friend Martha Stewart to come up with these adorable photo centerpieces! Unlike many of her projects, though, this one seems fairly straightforward. 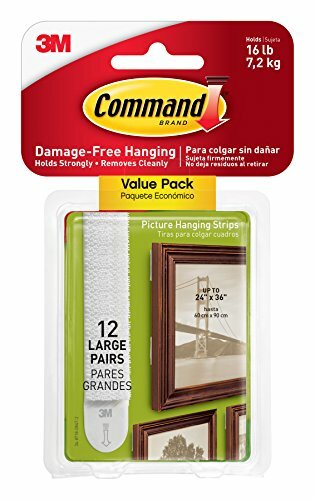 You just print pictures on vellum paper on your printer; add them to frames, and use duct tape to connect the frames to form a triangle. You could always paint the frames to match your color scheme if you’d like. Finish it off with a battery operated candle or a glass votive candle. 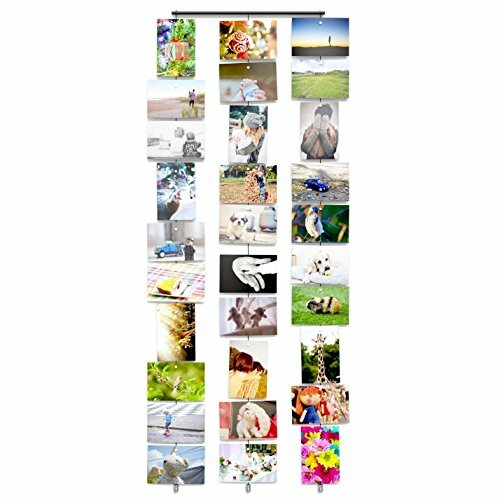 One of the easiest ways to decorate with photos is to buy a banner, like the one pictured above. 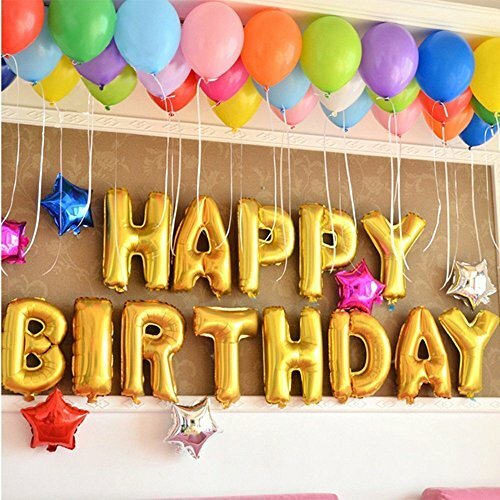 You just upload 3 photos, choose your text, and you’re created a sure-to-be-noticed decoration that will be the hit of the party. The banners come in 7 different sizes. 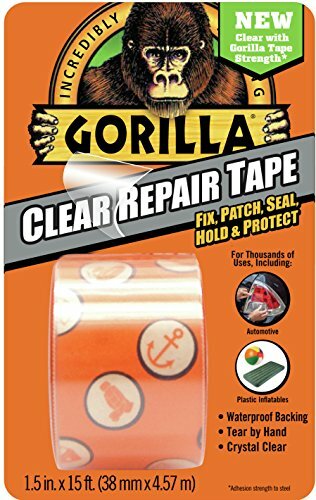 You can choose one with metal grommets for hanging with cords, or you can choose a low-tack adhesive one if you’re planning an indoor party. 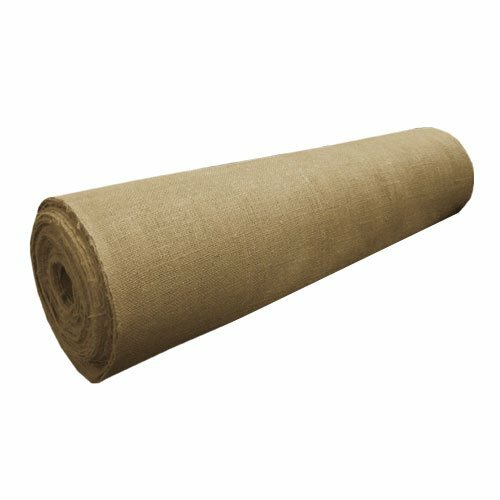 With prices starting at $15, a purchased banner is a great bang for your bucks! 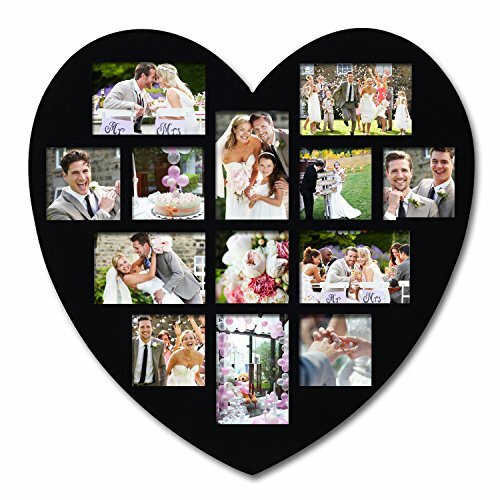 It doesn’t get much easier to show off your favorite photos with these simple-to-use pocket photo displays! 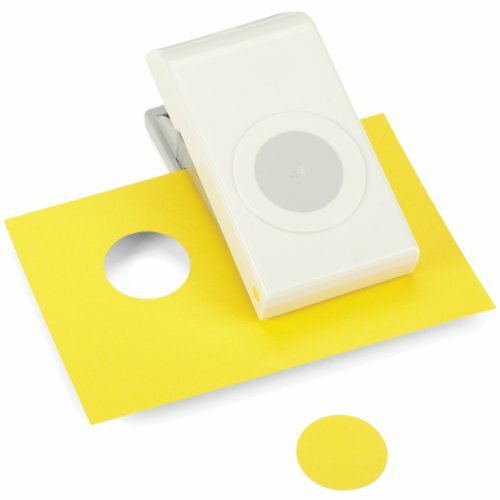 Just insert the pictures into the clear pocket and hang the display on the wall or the door. You can add two pictures to each pocket…just remember to turn the display over during the party so that guests can enjoy both sets of photos! The guest of honor can then enjoy the photo display at home after the party is over. 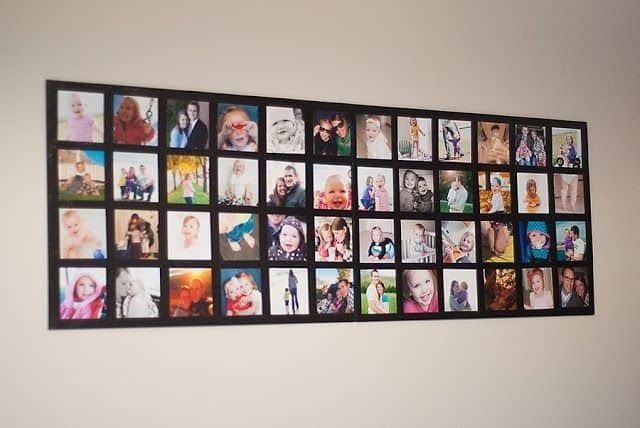 What a cute way to display your favorite photos of the birthday man or woman! 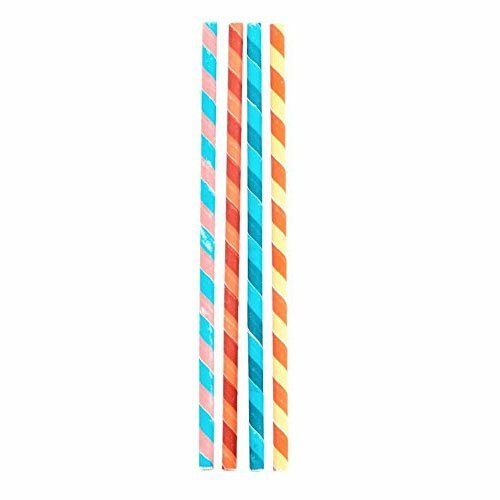 This easy-to-do project costs under $20 to make and can easily be customized to match the color scheme of your party. She decorated this with ornaments and silver bells, but you could add whatever decorations fit your mood. 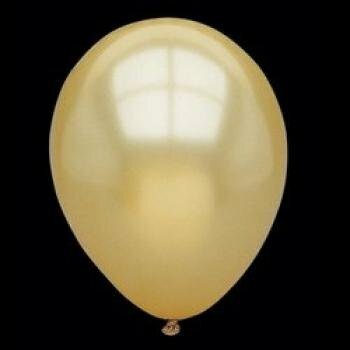 This is another fabulous party decoration that will also make a much-enjoyed home decoration after the party is over with! 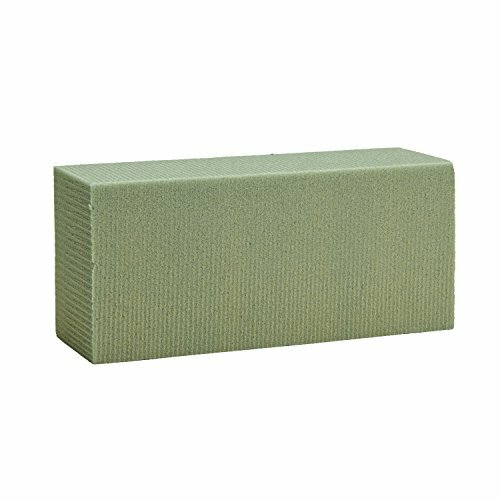 Cali over at Bits of Everything gives complete instructions on how to make this, using foam core boards from WalMart. 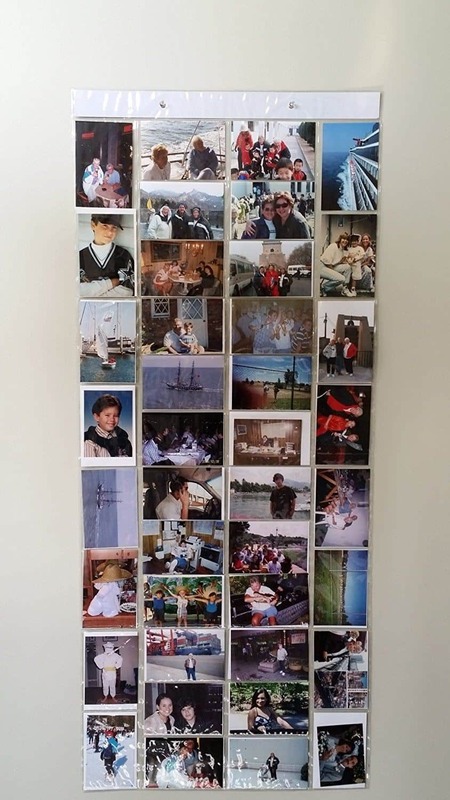 It’s a lovely way to showcase loads of photos from throughout the celebrant’s life. The whole project cost her under $20, and it looks fabulous! 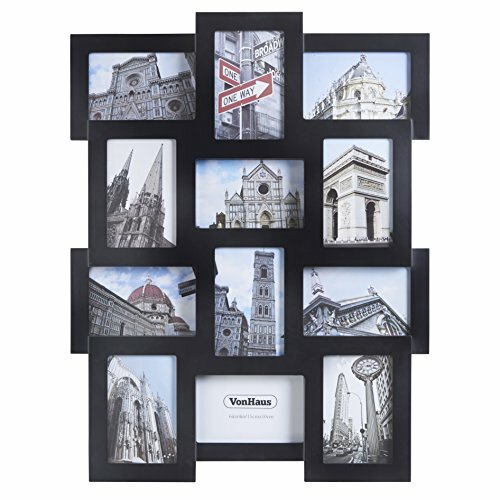 If you’re not the crafty sort, consider purchasing a large collage frame like the ones pictured below. 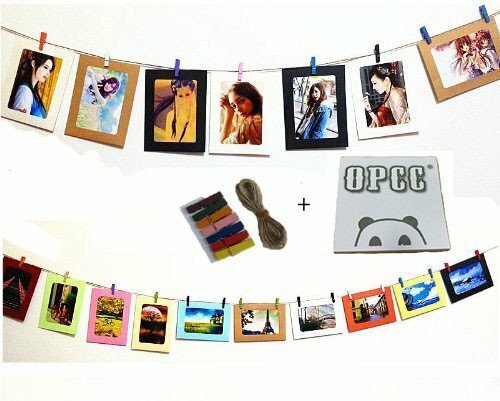 Simple but adorable, this photo banner is probably the easiest one you can make yourself. Just print out pictures of the birthday celebrant at different times of their life. 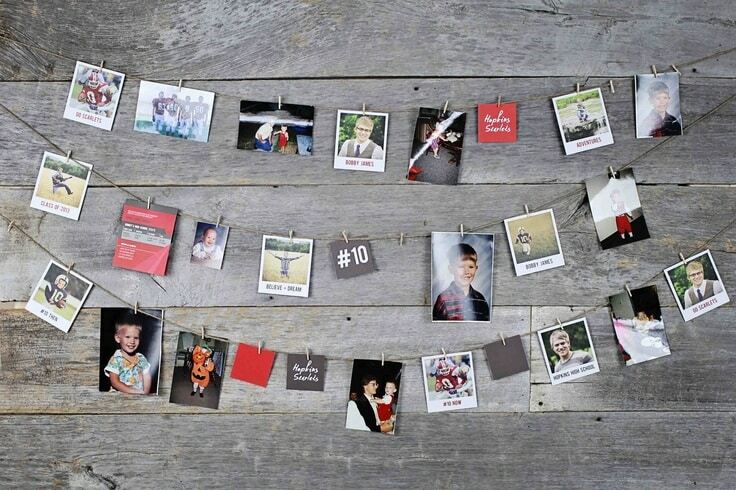 Hang twine, yarn or ribbon against a wall, and then use mini clothespins to attach the pictures. Another unique option is to add photos to the birthday cake. In the cake pictured above, they used edible photo stickers to put pictures directly on the cake. 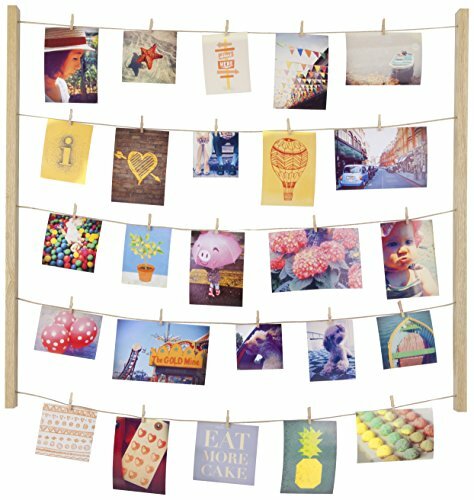 See if your local bakery, Costco, or Walmart will print edible photo stickers for you, or you can order custom-made edible photo stickers on Amazon. 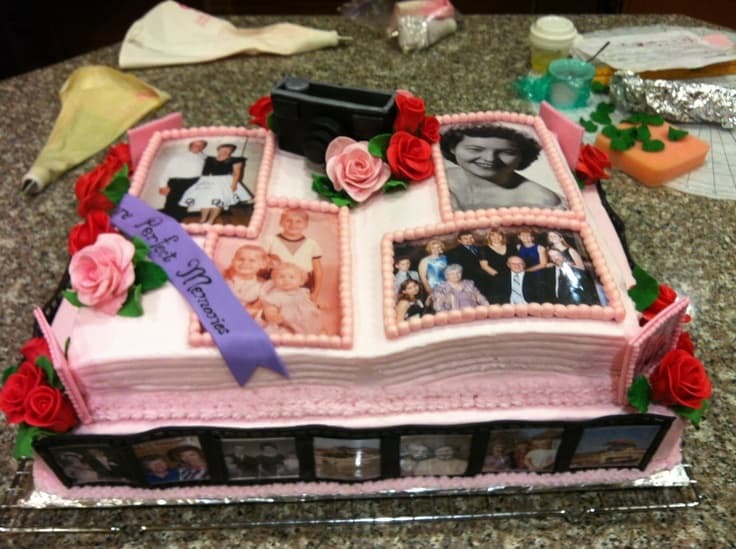 They also added surrounded the base of the cake with real photos. 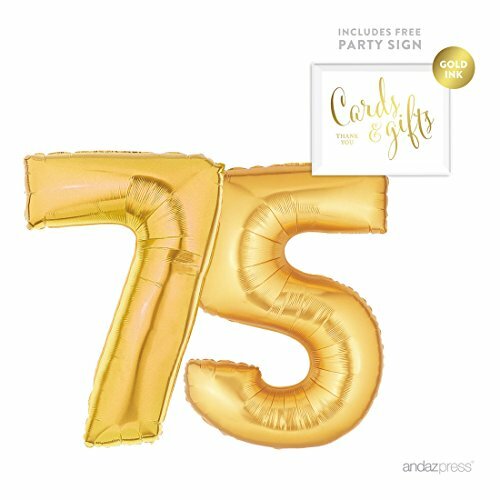 Get your guests pumped for an amazing party by placing photo yard signs along the walkway or driveway! 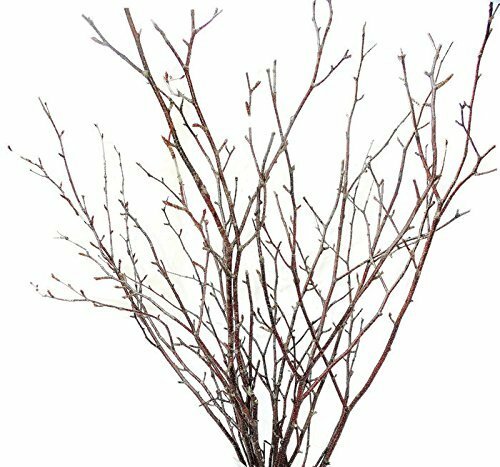 You could place several yard signs (they cost around $15 a piece), each with a different photo and saying. 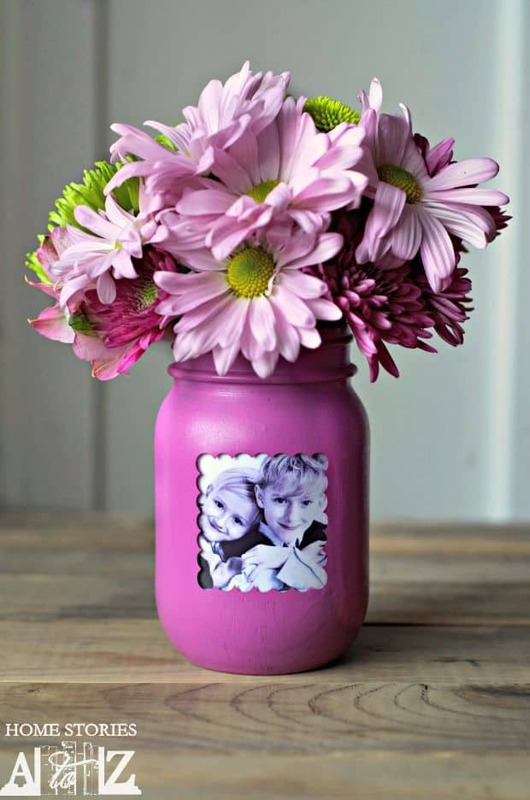 I love the versatility of these adorable mason jar photo vases! 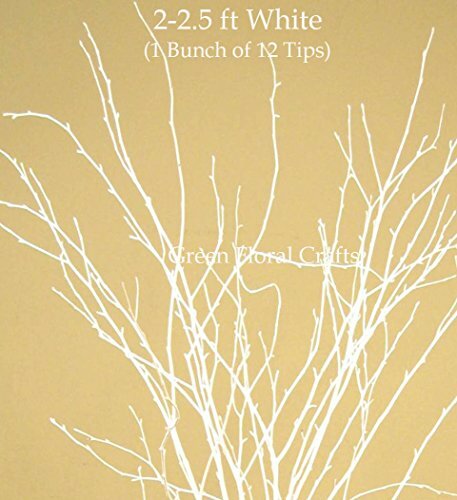 You can use any color paint to match your color scheme. 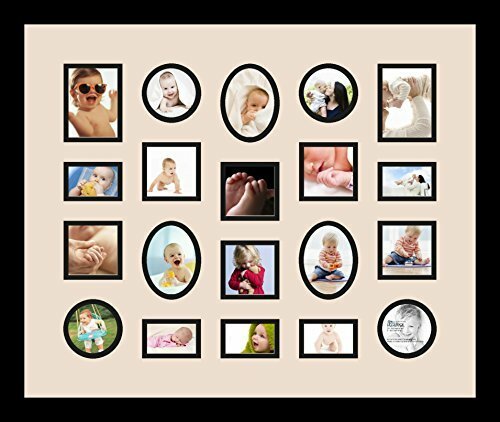 Add pictures of the birthday celebrant from different stages of their life and use them as centerpieces. 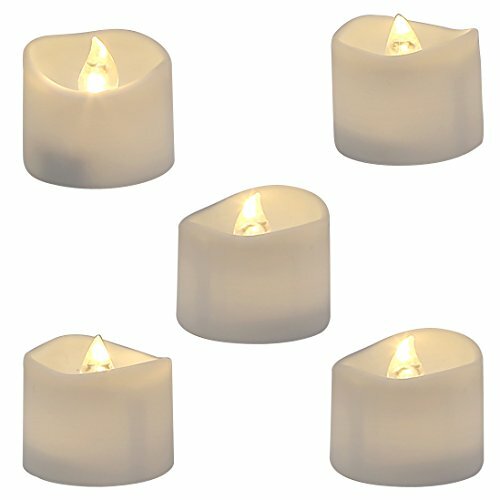 This picture shows them used as a vase, but you could also drop a battery-operated tea light in them for a different effect. 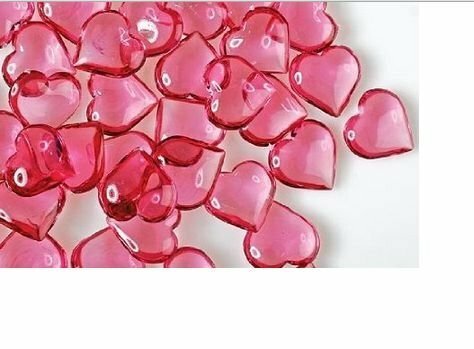 Cute, easy, and affordable! 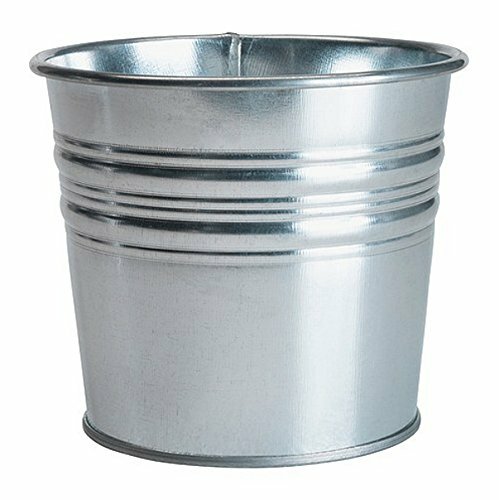 What a clever table decoration – and a wonderful gift after the party is over! 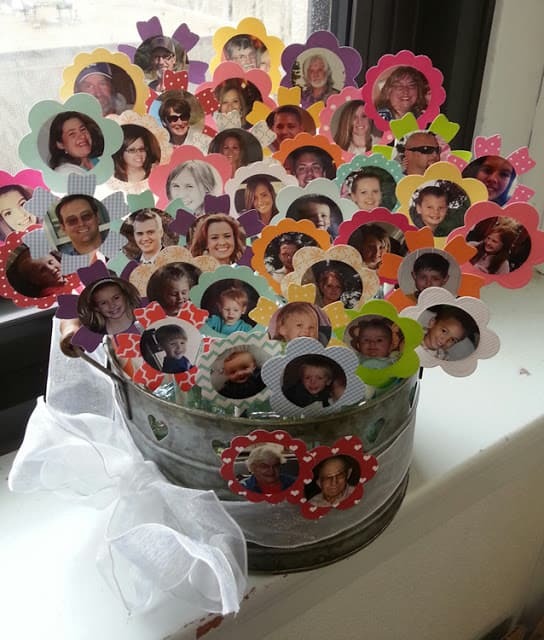 This adorable bouquet features photos of family and friends and is sure to be a crowd pleaser. A bit time consuming, but well worth the effort! 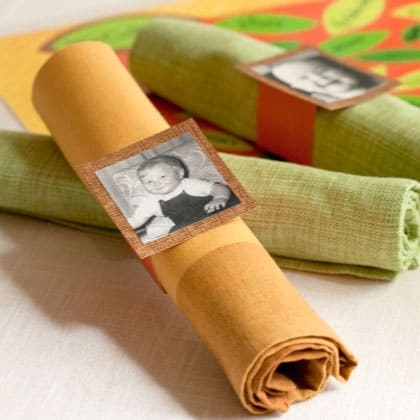 How cute are these photo napkin rings? Tara over at Feels Like Home gives easy instructions on how to make this using card stock and construction paper. A little detail that is sure to impress! What’s a birthday party without balloons? 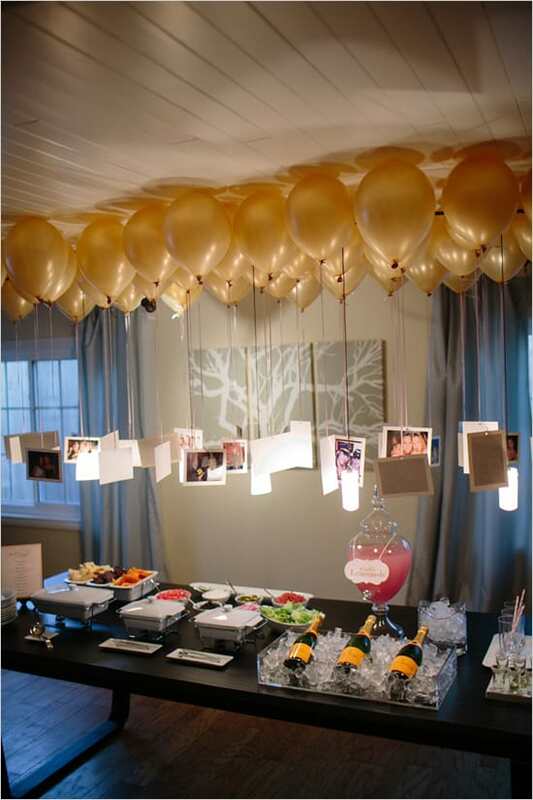 Add a special touch to your party by hanging your favorite pictures from the balloons! 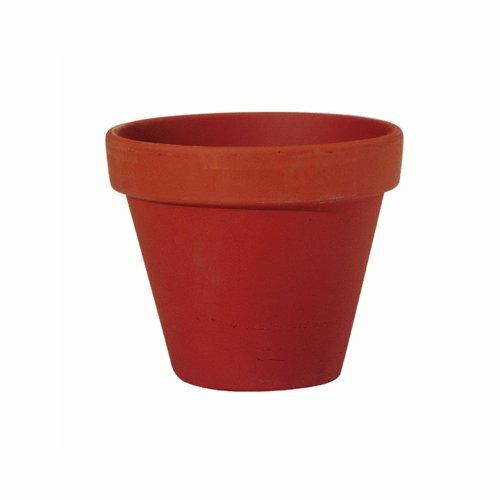 A fun, festive accent that would look great over the buffet table or anywhere! 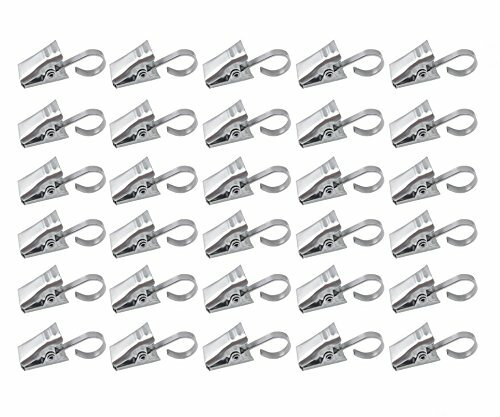 Of course, one of the easiest ways to use photos is to simply tape them to the wall in the shape of a heart or of the birthday number. 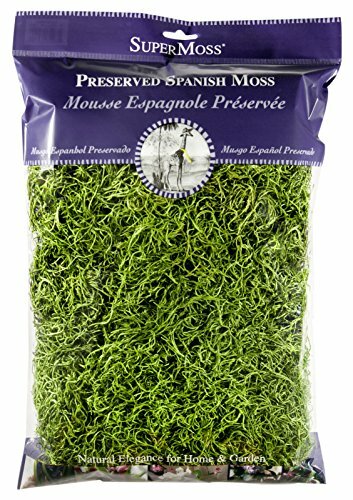 Great for displaying over the food or gift table! The only downside is that the birthday celebrant can’t take them home and enjoy it after the party. 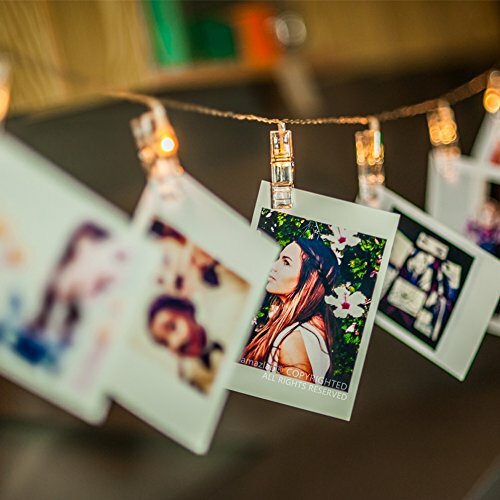 Highlight 3 of your favorite photos with unique photo confetti– perfect for showing how the guest of honor has changed over the years! 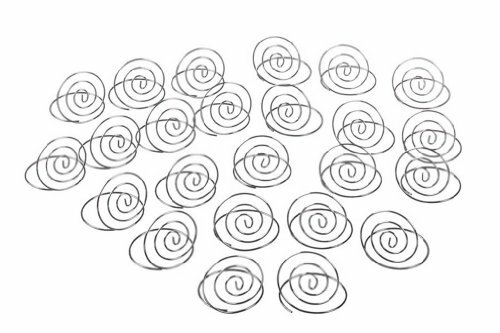 Pack of 27 pieces contains 6 large photo circles, 9 medium circles, and 12 circles. 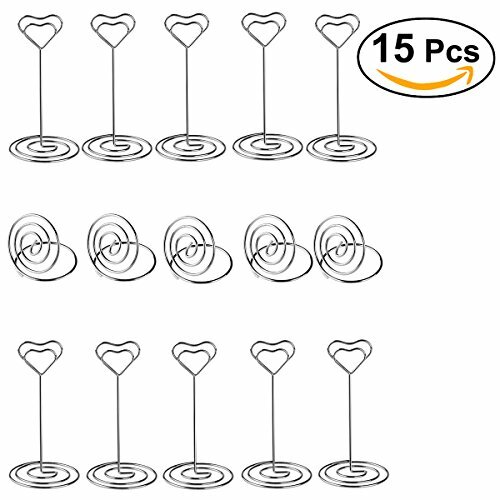 They look impressive scattered on the table, but they’re large enough that you can use them for other decorations, such as napkin rings, cake plate garland, mini cake banner, or cupcake toppers. Check out this article for inspiration. 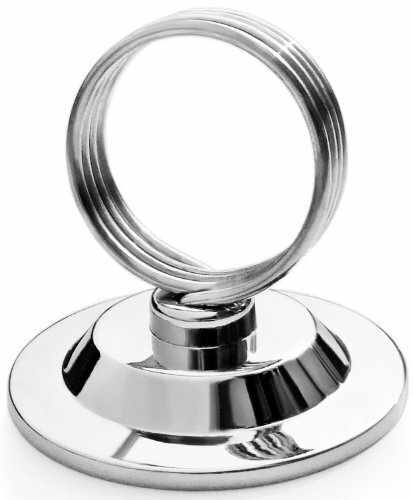 Place card holders are a stylish (and simple!) way to display a selection of photos along the table. You can mix and match different styles. 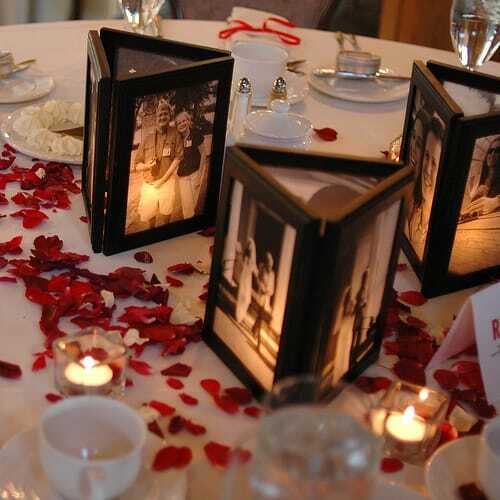 Add 2 photos to each place card holder so that the guests on both sides of the table will each be able to see a picture. 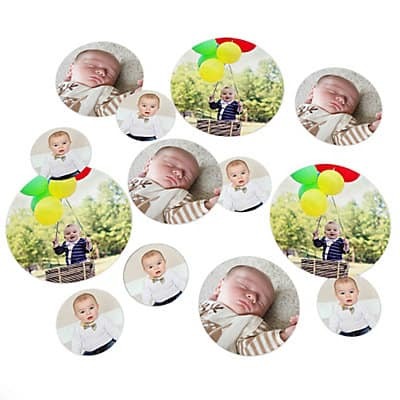 Another unique, and very easy option, is to add pictures to the birthday party plates. 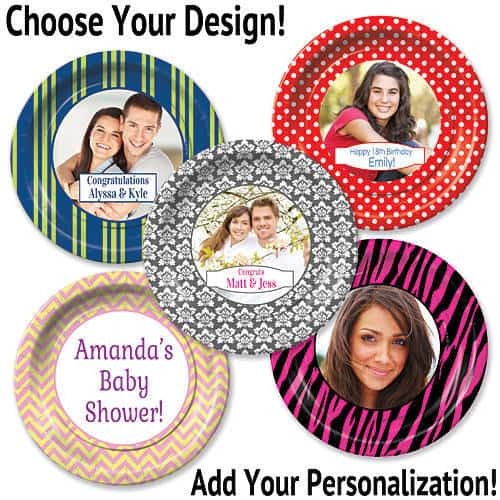 You can choose from dessert plates or dinner plates. 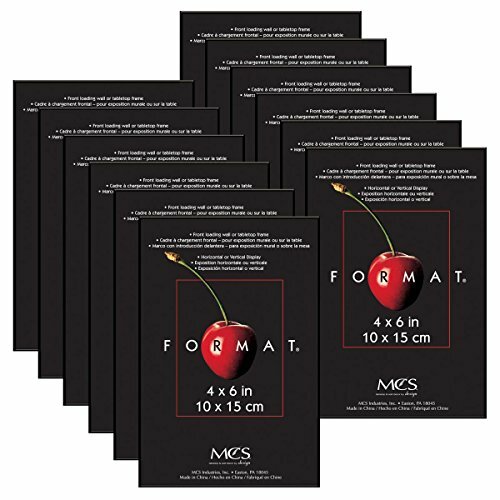 They’re sold in packs of 8, so if you’re party is large enough, it would be fun to order plates with pictures of the birthday man or woman at different ages. 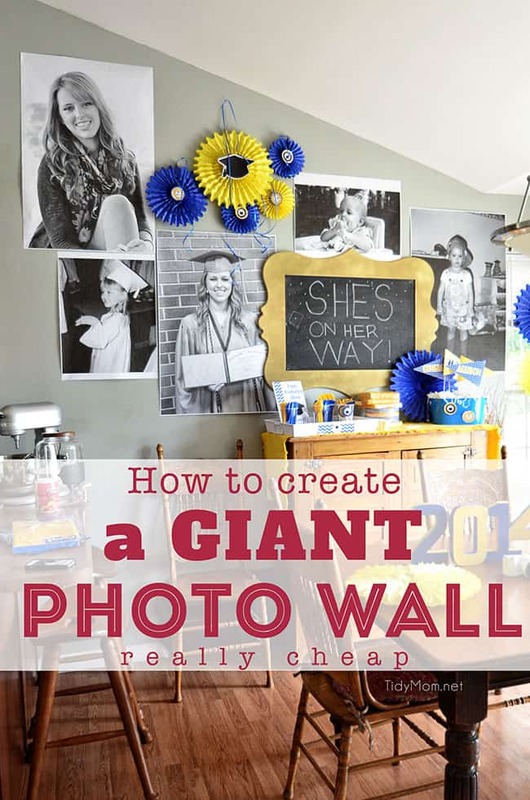 How fabulous is this giant photo wall? 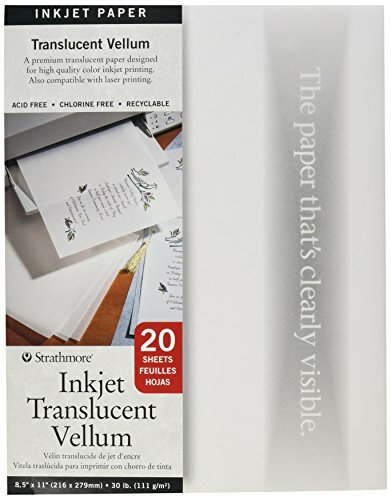 All you need is a local office supply (Office Max or Staples) that will print on blueprint paper (also known as engineering prints). 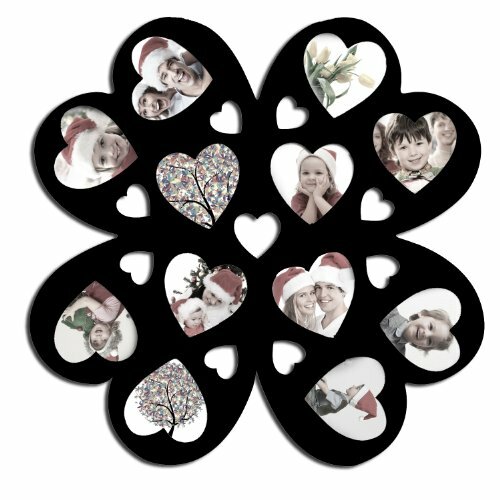 The photos will be black and white, so add a few colorful decorations to the wall to really draw attention to your masterpiece. 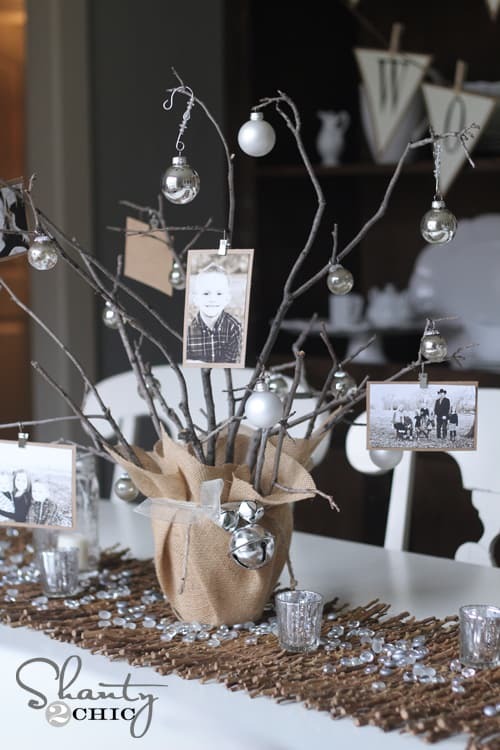 Another great bang-for-your-buck photo decorating idea! These great life-size standees are available for under $25 at Shindigz. What fun would it be to upload a picture of the birthday celebrant as a young man or woman, or perhaps as a teenager. 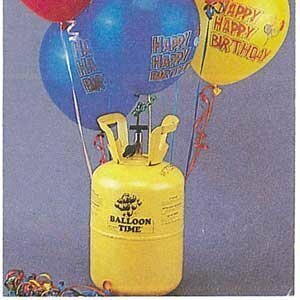 The party-goers would have a blast taking pictures with it! You can also order an optional motion activated voice recorder to greet people as they walk by. 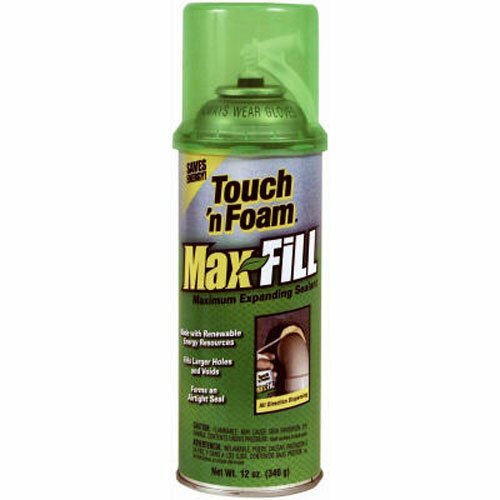 Sure to be the hit of the party! 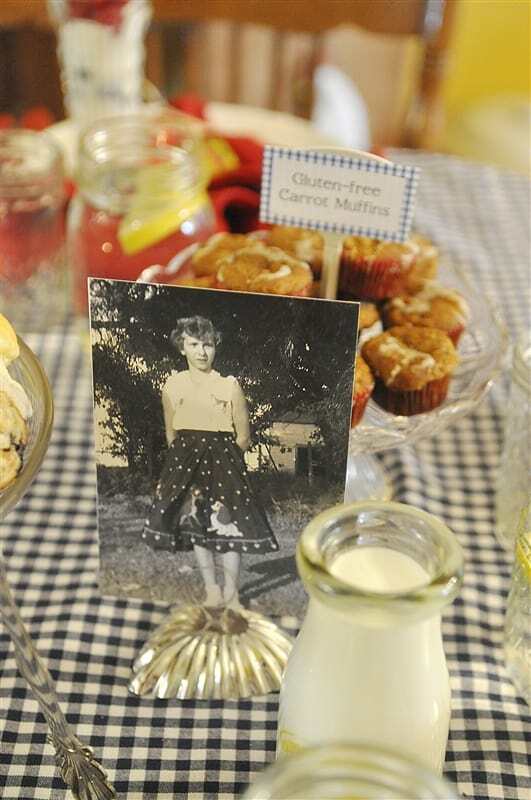 The talented Eileen at Queenie Eileen created this cute photo banner for her Mom’s 80th birthday party. She didn’t write instructions, but it looks pretty straightforward. 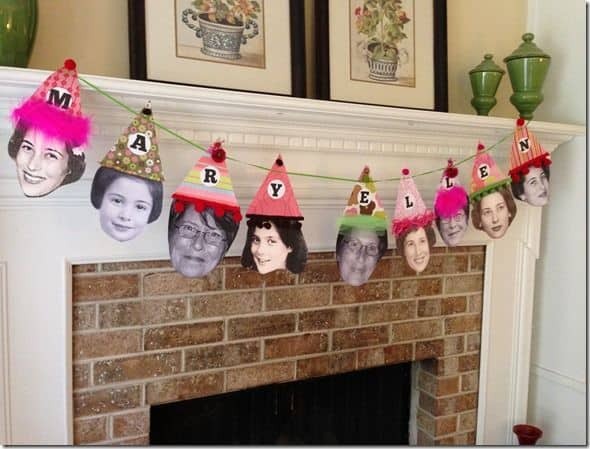 She simply printed off photos of her mom at different phases of her life, then made her own cute little party hats. Clever and oh-so-cute! 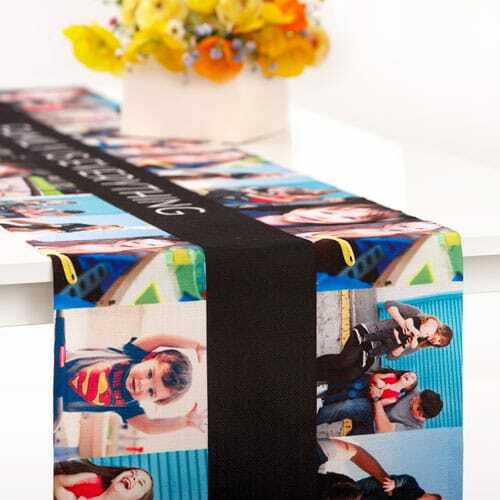 A photo table topper or runner is another easy decoration that’s sure to draw loads of compliments! 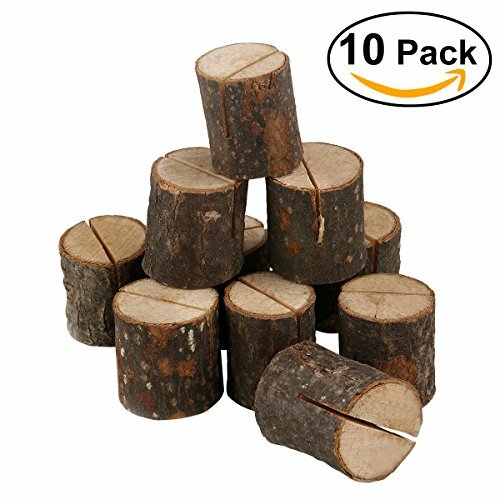 Table toppers are perfect for dining tables, or they would be a wonderful way to decorate the gift table or cake table. 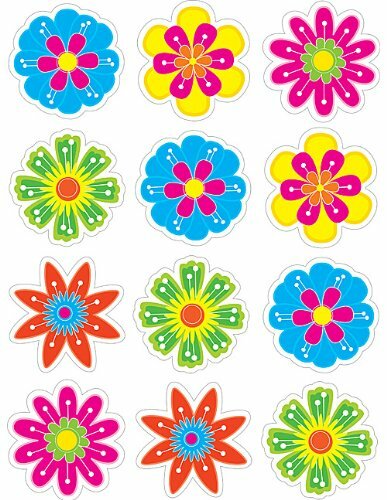 Shindigz offers over 100 different designs in rectangle and square shapes, all priced at well below $20. 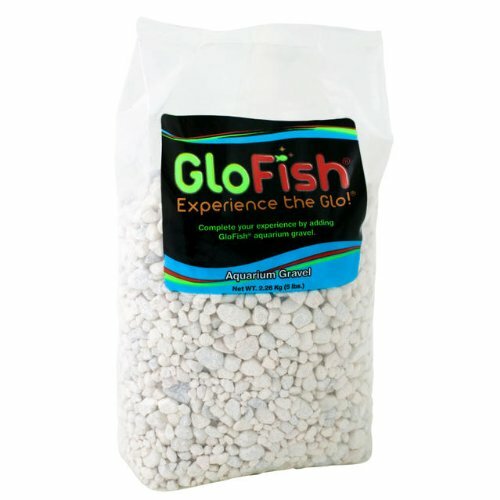 A low-cost decoration that makes a huge impact! 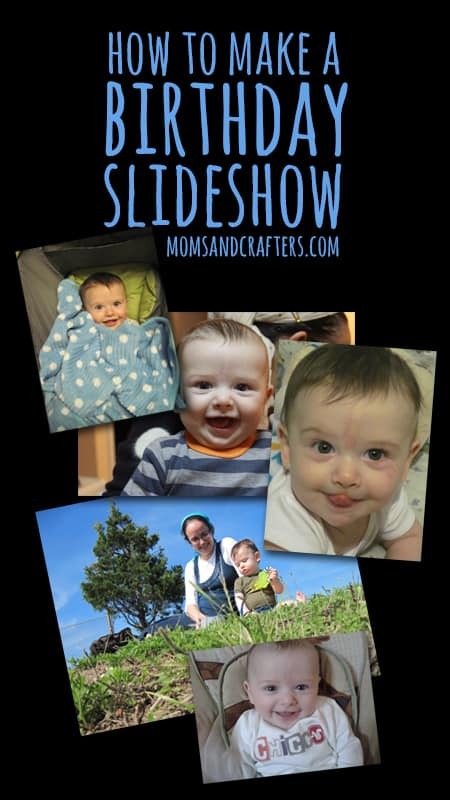 A slideshow is a fabulous way to display loads of photos, especially if you’re going to have a large screen at the birthday party. The easiest way to make a slideshow is just to grab the nearest teen and have him or her make one. 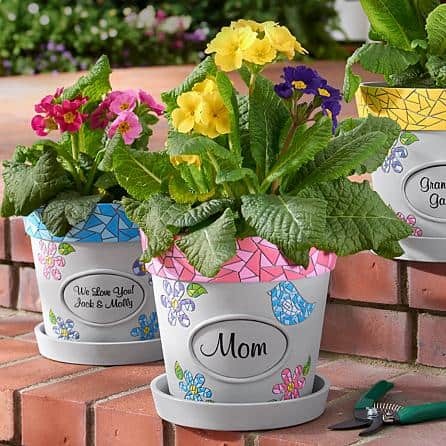 If you’re planning to do it yourself, start with these easy instructions from Moms and Crafters.